Retirement list is now available! 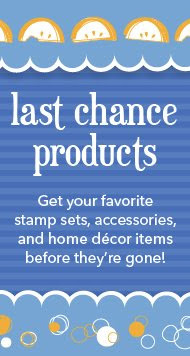 The new 2009 - 2010 Idea Book & Catalog is making it's debut on July 1st, and in order to make room for all the new, we have to say goodbye to dozens of stamps and accessories! While some of these sets I'm happy to see go (Zoofari) others I'm sad about (Short Order alphabet, are you kidding me?!). I'm pretty sure I'll get over it once I see the new catalog! Most items are marked down 25 to 50%, and some things have already sold out. You can't pass up a good sale. And to sweeten the deal, I'll give you an extra 10% off anything on the lists through the rest of the month. Sound good? Retiring sets and accessories are available while supplies last. It's been a while since I posted anything. Between the kids, school, sports and working part-time, I just haven't made the time to sit down and play in my scrap room. Not to mention, we put in new flooring two months ago, and since then my scrap room has turned into the junk room, and I literally have a little path that leads to my craft table. Not the most creative environment to work in! 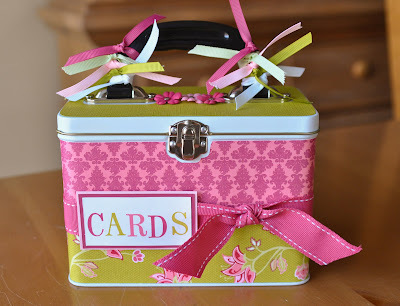 Still, I managed to whip up this cute little project for my stamp club girls! 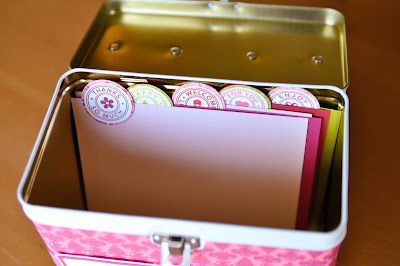 I've seen these cute altered tins everywhere, and I thought it would be nice for my stamp club girls to make something to put all their cards in. I made little dividers for the inside using the Riveting stamp step. It's a retired set, but it worked well for creating themes for each divider. I used this template from SCS for the paper adhered to the top and the notch in the front, but I had a hard time getting the holes to line up. You sort of have to eyeball it and trim as you go. I think I'm going to make another one for my Cuttlebug and SU dies and embossing folders. They fit inside perfectly! I'll probably have a lunch tin class soon. I'm dying to use the Rockabilly paper on these! I ordered the Provo Craft tins from here. The prices were good and the shipping cost was the lowest I found anywhere. You order them in lots of three. One pack of DSP will cover 18 tins. Cut the strips 2" x 12" (you'll need a total for 4 strips in two different patterns for each tin). Using the template above, cut out your notch in the middle of one of the strips (or you can use a small circle punch). Adhere strips to box with sticky strip or other strong adhesive. You'll have a bit of uncovered space in the middle, but you'll cover that with ribbon. Use the template and cut your paper for the lid. The dividers are 4 x 6, and I used circle punches to make the tabs. I used the 1" stitched ribbon to around the middle, but you could use 5/8" too. Decorate the handle with 1/4" grosgrain or whatever ribbon you prefer. Decorate the front however you'd like! I stamped CARDS using the Typeset alphabet (retired), double mounted onto cardstock and adhered with dimensionals. Supplies used: Typeset alpha and Riveting (both retired sets), Raspberry Tart Designer Series paper, Rose Red, Pink Pirouette, Regal Rose and Kiwi Kiss cardstock and ink, 1" Rose Red stitched grosgrain ribbon, 1/4" grosgrain in white, Pretty in Pink, Old Olive, Certainly Celery and Rose Red. Round punches, Prima flowers, silver brads. Provo Craft lunch tin. Here are a couple of goodies I made for my stamp club. The Parisian Breeze DSP is my new favorite paper - if you don't have it, you MUST get it! As with some of the Designer Series papers in the catalog, it's so much prettier in person! 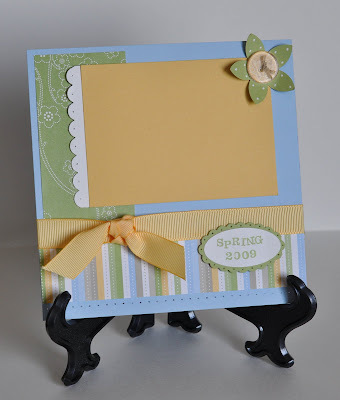 This page uses the Delicate Dots DSP and So Saffron grosgrain ribbon, both FREE Sale-A-Bration items. I love free stuff! The scalloped oval will be available in the Occasions mini catalog beginning April 1st. Now, I know that my flowers look a little squished on the tag - that's because this isn't MY card, lol. MINE had my sentiment stamped a little lower so that everything looked perfectly balanced in the tag. I'm not saying who took my card home, but I know who you are...! I'm "so glad we're friends", lol! :) BTW, every sentiment in the Best Yet set, which is the set I used on this card, fits perfectly in the large metal edge tags (also by SU). I've had these tags laying around forever wondering what to put on them, and now I know! 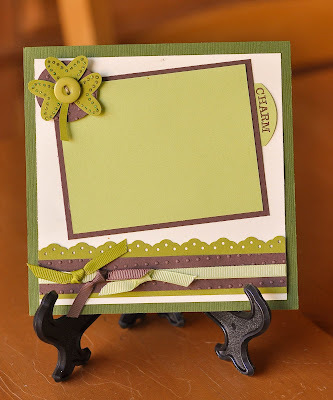 Supplies used: Garden Green, Chocolate Chip, Very Vanilla, Old Olive and Certainly Celery cardstock, grosgrain ribbons, Earth Elements button, stickles, embossing folder, hearts, circle and eyelet border punches. My girlfriend asked me if I could come up with a simple Easter card project for an upcoming event. It's a small get together with no sales involved (though there is a small fee to make the card), so I thought it would be ok to use some retired products. 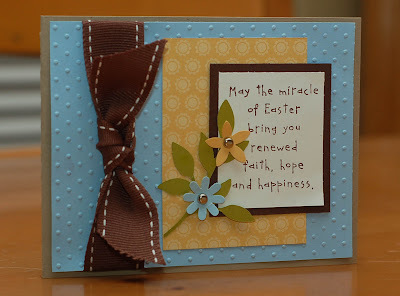 Until my new sets from the Occasions mini-catalog arrive, I have to make do with Faith & Hope, and oldie but much loved Easter stamp set from the 2006 mini catalog. I love this set, and I don't think I'll ever part with it! I used the phrase stamp from that set, along with the retired Spring Flowers punch. I feel like it's missing something though...maybe more layers? 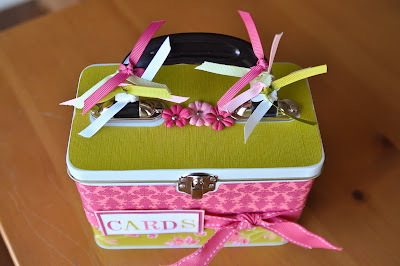 As I was making this card, I realized that I'm a total ribbon addict, and I was wondering if it was possible for me to make a card, scrapbook page, anything without ribbon on it... Maybe that will be a challenge for me this month! 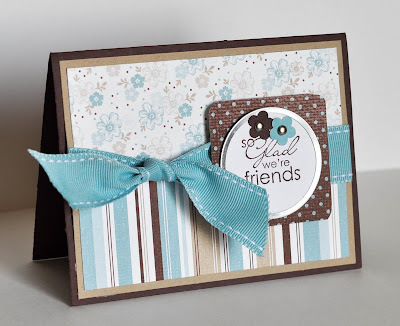 Supplies used: Faith & Hope stamp set, Bashful Blue, Chocolate Chip, Kraft, So Saffron and Kiwi Kiss cardstock, Washington Apple DSP, Chocolate Chip ink and wide grosgrain ribbon, Spring Flowers punch, silver brads, Big Shot "Little Leaves" die, Cuttlebug polka dot embossing folder. I officially became the mother of a teenager today. It seems like just yesterday I was brushing her hair into pig tails, buying everything in shades of pink, and holding her hand. Now she's grown into a beautiful young lady, except she won't be caught dead in anything pink, wears her hair in her eyes, and almost dies of humiliation from my public displays of affection. Aw...the joys of raising a teenage girl! I made this card to celebrate Hayley's 13th birthday. Her favorite colors are green, blue and purple, so I used Kiwi Kiss, Baja Breeze (though for some reason it looks more like Cool Caribbean in the pic), and Perfect Plum. It's fun and spunky, just like her! Supplies used: Kiwi Kiss, Perfect Plum, Baja Breeze, Black and Whisper White cardstock, chipboard letter, white craft ink, Cuttlebug embossing folder, green glitter, heart punch, white gel pen, non-SU ribbon. Each year SU has an Artisan Award competition, designed to recognize demonstrators for their talent and creativity. Now I'm not so sure how I rate, but I've decided that I'm giving it a shot this year! I mean, why not? If anything it will be fun, and a great way to challenge myself and get the creative juices flowing! Entries must consist of five cards, three scrapbook pages (8.5 x 11, 12x12, or 8.5 x 8.5), and two 3-D items. I think the scrapbook pages will be the most challenging for me, but I can't wait to get started! I have until April 20th to submit my entries. I can't wait to get started!! I live near wine country in sunny Southern California. I'm a busy mom of three, and a Stampin' Up demonstrator. I love making things with stamp and paper! 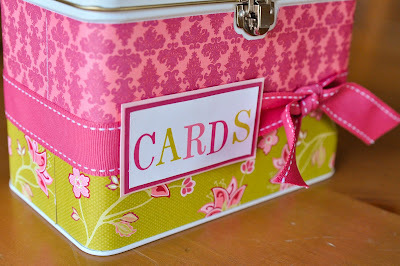 Cards, scrapbooks, altered items - I have fun doing it all! I love reading blogs for ideas and inspiration, and I created this one as a fun way to connect with and inspire my crafty friends and customers! Click here to download the Spring catalog in .pdf format!